Campbell Scientific's NL240 is a wireless networking peripheral that provides Wi-Fi connectivity to our dataloggers and peripheral devices over an 802.11b/g/n network. The NL240 unleashes the IP capabilities of the datalogger, delivers the power of PakBus networking, and unwires your serial-based devices. 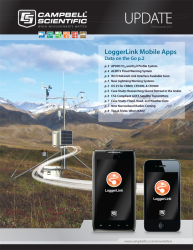 For on-the-go access, pair up the NL240 with our new LoggerLink Apps on your iOS or Android device (see LoggerLink article at right). The NL240 can take advantage of the thousands of Wi-Fi hotspots available in cafés, universities, hotels, and airports. Wi-Fi also provides encryption to protect traffic and uses a global set of standards so the same device can be used internationally. By providing these powerful features, the NL240 can serve a wide range of applications to better meet your networking needs.